Don't worry, Louis Vuitton fans, eLuxury will be back soon enough. 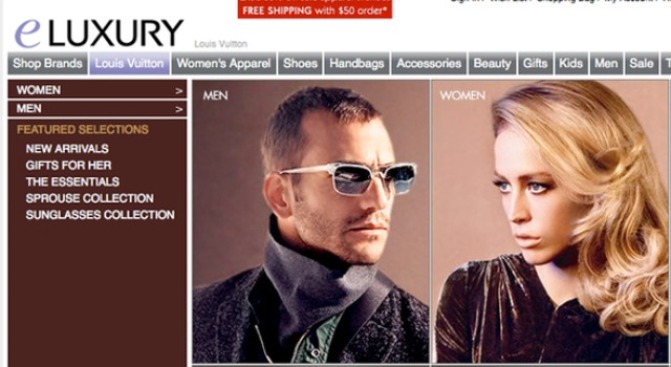 After announcing the news back in January, high-end e-tailer eLuxury has officially shut down shopping on its massive site. For the loyals currently wondering how they'll get their fix of Louis Vuitton bags and $300 sunglasses, never fear: Insiders report that eLuxury will be back and better than ever ... granted, as a social networking site of sorts. In earlier reports, a spokesperson for the brand (which was launched by none other than LVMH) was quoted as saying that the new site would offer "an 'e-window' into the world of luxury," a description that seemed whimsical at the time (is it a social media site, as WWD is now reporting? Or is it a gussied-up blog? ), and unfortunately details are really no clearer today, though we now have word that the site will be "artfully rendered and provocatively expressed." For the time being, the site will pose a question a day as it works up to a big relaunch. Cheesy and schticky? Most definitely. (Just to give you an idea, today's question is: "Dirty Martini or Virgin Mary?" Um, what kind of data are they trying to gather on their prospective consumers, exactly?) But it'll give us all something to do while we wait for the site's new iteration to appear in early 2010.